Butcher Block Co. countertops are available in the four most popular North American hardwoods - Rock Maple, American Cherry, Black Walnut and Red Oak – plus 11 other equally spectacular species: Ash, Beech, Birch, Brazilian Cherry, Hickory, Knotty Alder, Knotty Pine, Mahogany, Poplar, Spanish Cedar and White Oak. View our extraordinary array of species and grain styles. If you’re looking for a gorgeous island or counter top for a residential or commercial kitchen, you’ll find a wide range of stunning options in various shades of beige, tan, brown, reddish brown and gold. Choose among species with muted, consistent coloration to others with medium to high color variegation. For workshop or industrial applications, opt for a species that’s especially hard. Soft and moderately hard species should be suitable for most home and commercial offices. IMPORTANT NOTE: These custom-size counter tops and cutting boards are not reversible. For 15% more, you can make yours reversible. Just give us a call,. 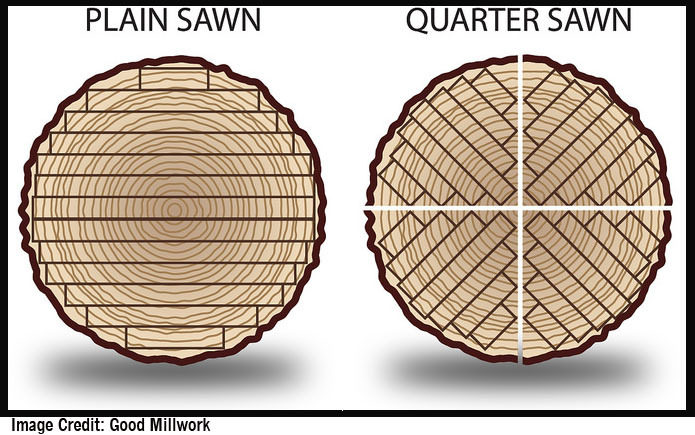 When lumber is quarter-sawn, it means the log was first cut into four quarters, just as you might cut a pie into four equal-size slices, then each quarter of the log is sawn. As a result, the annual rings of the source tree run perpendicular to the faces of the harvested boards, which reveal striped grain lines that run fairly straight and provide a unique look that some people prefer for wood counters and furniture. The other key advantage of quarter-sawn countertops is their superior stability. Each rail of the top is much less likely to warp or cup (i.e., become concave - high on outside edges and low in the center). The Janka hardness test, which measures a wood’s resistance to denting, is widely accepted as the standard for comparing different wood types on hardness. The test measures the amount of force, in pounds-force (lbf), required to embed a steel ball of specific size into the wood. As you view the data, keep in mind two points. First, the hardness of wood varies depending on its orientation (i.e., testing along the wood’s grain vs. against it). Second, findings can vary from sample to sample, and even within a particular sample. Consequently, you should not consider any data point as especially meaningful. Rather, we share these findings to give you a general sense of the hardness of a species relative to others. Here's another visual tool to help you choose a species based on both of the above attributes: appearance and hardness. 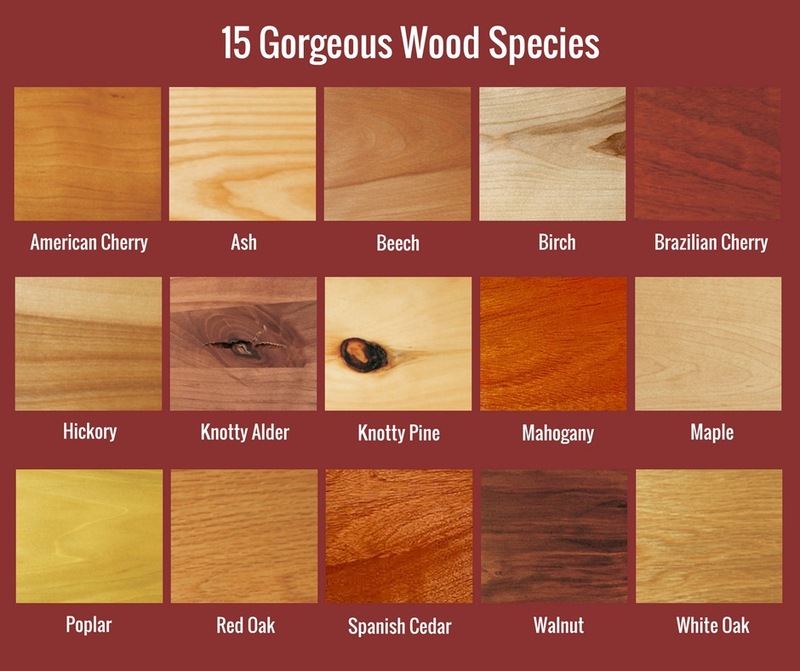 Very Affordable: Poplar, Knotty Alder, Knotty Pine, Beech, Ash and Birch are the least expensive options. 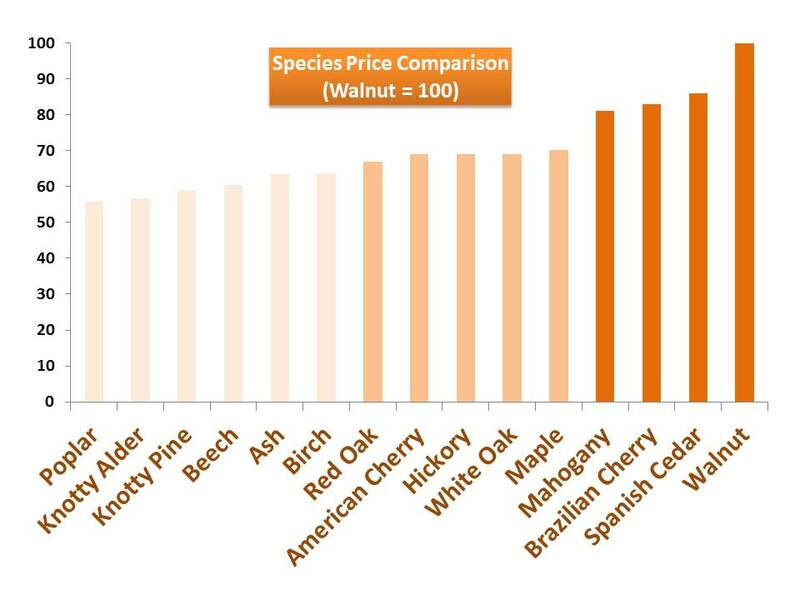 They typically cost somewhere between half to about two-thirds as much as walnut, the price leader. 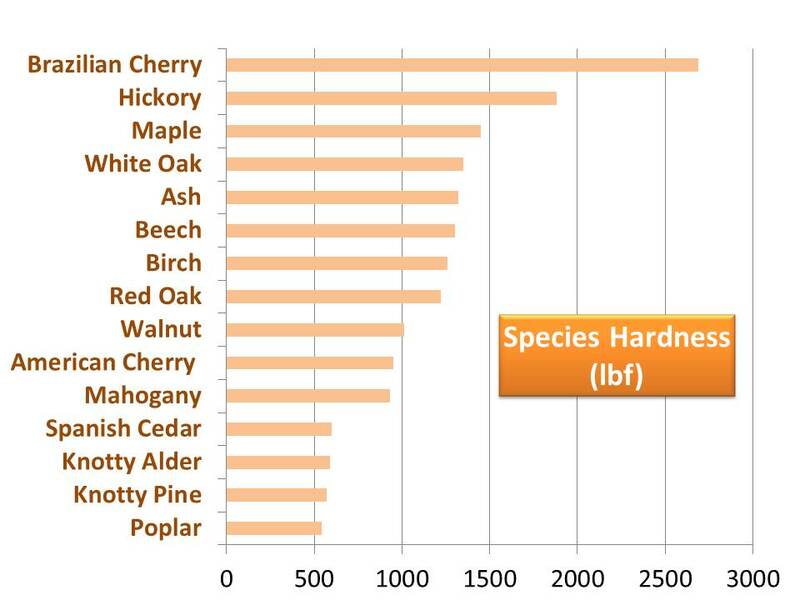 Moderately Affordable: In the mid-priced tier are classic varieties: Red and White Oak, American Cherry, Hickory and Maple. More Pricey: Accompanying Walnut in the higher-priced bracket are Mahogany, Brazilian Cherry and Spanish Cedar. These species are also considered the most visually striking. 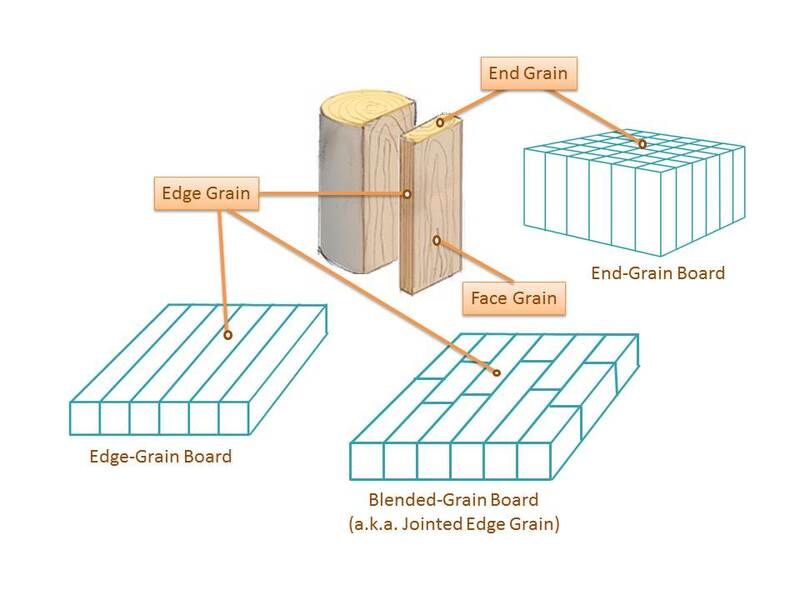 Edge-grain wood is constructed by bonding together long wood rails that run the full length of the block. 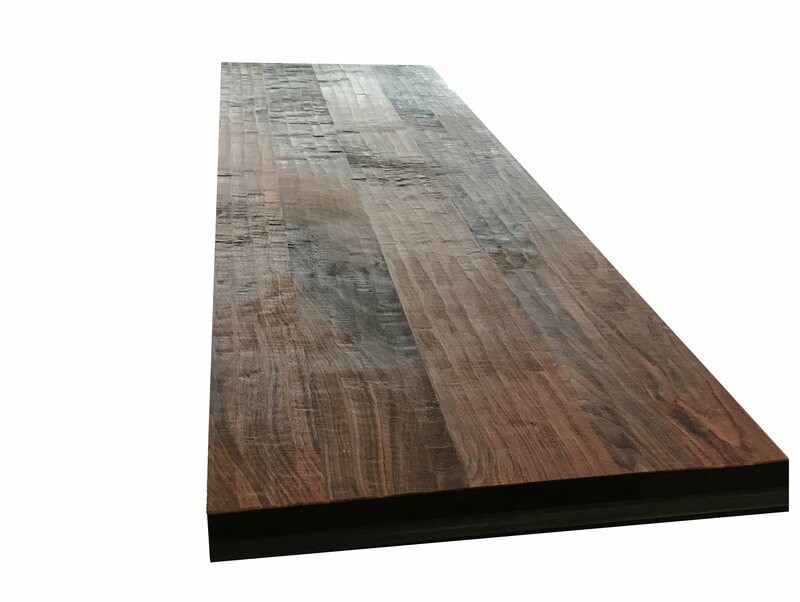 The wood rails are arranged face to face, so it’s the edge grain of the wood that shows on the surface of the countertop. In contrast, end-grain tops provide glimpses of the growth rings of the source tree. Regardless, the wood rails used in Butcher Block Co. countertops are 1-inch wide strips. As mentioned, in edge-grain countertops each wood rail spans the top’s full length; whereas our end-grain counters utilize rails from 1-1/2 to 6 inches long and arranged in rows that run parallel to the width of the counter. 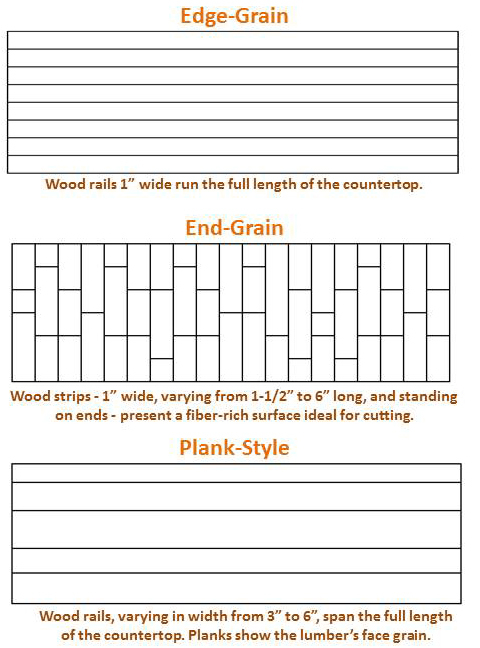 As an alternative to butcher block, you might want to consider plank-style countertops. As their name suggests, they are comprised of wood planks bonded together, side by side, running parallel to the length of the counter or kitchen island. The surface of such a countertop will present the face grain of the source lumber. Our plank-style island and counter tops utilize boards that vary in width. Some will be as narrow as 3 inches wide, and others will be up to 6 inches wide. We find this variation provides a more natural and interesting look. If you’re seeking an antique-like appearance or the look of authenticity, consider specifying a hand-scraped finish for your edge-grain or plank countertops. To produce this effect, the Amish craftsmen who make all our lovely countertops guide a wood scraper longitudinally along the wood, causing very slight variations in its surface. The effect is most noticeable when viewing the wood under nearly horizontal lighting, which tends to accentuate the unevenness. Small or Extra-Large Countertops; Unfinished, Oiled or Varnished. BB Co.'s standard (default) edge is "square, sanded lightly," to remove any sharpness. This edge style is perfect where a countertop will abut a wall, for instance. If you like to think outside the box, consider edge styles with a bit more visual interest, such as Eased, Beveled, Radiused or Cove. 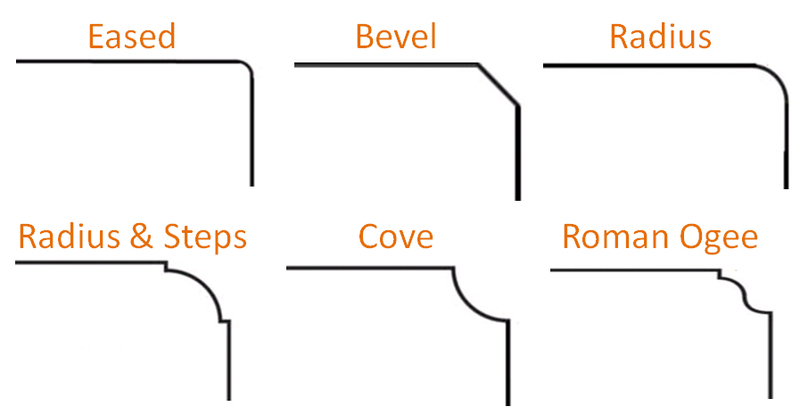 For a timeless look, think about the elegant Radius & Step edge design or the classic Roman Ogee (two sizes). Need a backsplash or two, or three? No problem. Just give us a call or send us an email. There’s no classier way to finish off your kitchen remodel. The window for adjusting or canceling an order is very narrow (24 hours). 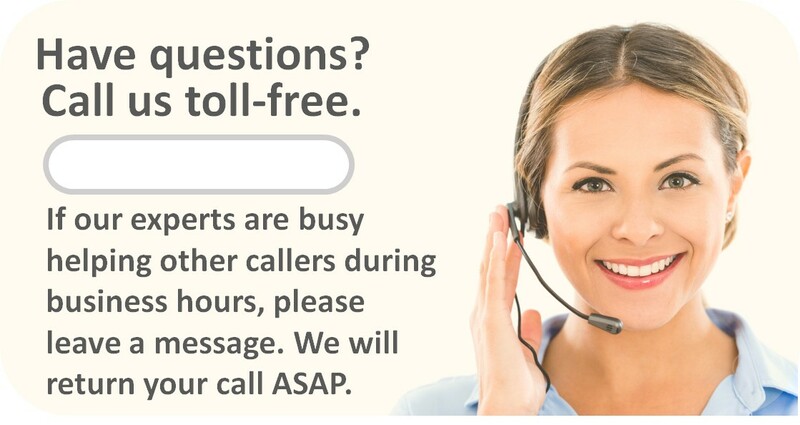 If you need to change or cancel yours, contact us immediately. After 24 hours, your order cannot be canceled. If a change to your order can still be accommodated, it might require a 20% change fee. We warrant that your countertop will be free of defects upon arrival. If it appears to be defective or damaged, you must notify us by phone or email within seven days of receipt. If it is determined to have defects in materials or workmanship, or to have suffered damage during shipment, it might need to be returned to us for repair or replacement, at our discretion. Furthermore, we will cover any glue-joint delamination that occurs within one year from receipt. If a glue joint does delaminate, please notify us promptly. The countertop might need to be returned to us for replacement or repair, at our discretion. We will cover return shipping charges and appreciate your patience while we work toward an expedited resolution. The countertop is not properly maintained. If the finish is natural oil, oil must be applied to all accessible surfaces on a regular basis. Variations in color and/or grain are not considered defects. Minor warping is not considered a defect. No promise can be made with respect to the ratio of heartwood to sapwood in any countertop.